Sunday 14 October 2018, 9.30 am. Literature Cambridge and Lucy Cavendish College hosted a reading of Woolf's To the Lighthouse (1927) in its entirety. Some people came for the whole day, others came for an hour or so during the day to listen. Many people contributed as readers. It was marvellous to hear the novel brought alive in a new way, in many different voices. Many thanks to all our readers. We are planning another all-day reading in October 2019. This will be of The Waves (1931), following our Study Day on The Waves at Stapleford Granary on 21 September 2019. Bookings for the Study Day open soon. Tuesday 30 October 2018, 1.00 pm. Clara Jones, King's College, London. This talk introduced two previously unpublished sketches written by Virginia Woolf in 1931. Discovered in the pages of a little-known notebook held in the Morgan Library in New York, the 'Cook Sketch' and 'The Villa Jones' differ formally but collectively suggest an alternative starting point for the much-discussed political turn in Woolf's writing during the 1930s. Written entirely in the voice of a domestic cook, the 'Cook Sketch' represents an unprecedented act of class ventriloquism on Woolf's part. By positioning the voice of the sketch in relation to Woolf's failure to include working-class voices in The Waves and her encounter with the autobiographical writing of Guildswomen in the 1931 collection Life as We Have Known It, Clara Jones suggested how it might inform our understanding of Woolf's (often vexed) attitudes towards class in her life and writing. In 'The Villa Jones', Woolf adopts the voice of a supercilious letter-writer, 'appalled' by the despoliation of the Sussex Downs by 'Jones', an archetypal showy, middle-class villa owner. Dr Jones read this letter-essay in the context of Woolf's relationship to the countryside surrounding her home in Rodmell and the rise of the rural preservation discourses she apes so convincingly in this sketch. Both sketches provided Woolf with an opportunity to test her ear and try out new voices – probing her limits as a writer. But it is significant that the voices of Cook and of the letter-writer are both invested with political urgency and a kind of will to participate. They rehearse the questions about class, culture, community and political action that dominate The Years, 'Three Guineas' and Between the Acts later in the 1930s. We enjoyed two lectures on Woolf's contemporaries, Katherine Mansfield and Elizabeth Bowen. David Trotter gave a fascinating talk on episodes involving communication at a distance in Virginia Woolf’s The Waves and stories by Katherine Mansfield, notably ‘Psychology’, ‘Bliss’, ‘The Man without a Temperament’, and ‘The Stranger’. How do we understand material loss in wartime? In 1940, houses Virginia Woolf had lived in (at 52 Tavistock Square and 37 Mecklenburgh Square) were both bombed. The Regent's Park residence of her friend Elizabeth Bowen was bombed twice during the war. Aoife Byrne explored the ways in which Bowen responds to the upheavals of war, and how this experience changed the meanings of home. Wednesday 18 October 2017, 1.00 pm. Lucy Cavendish College. An extract from this lecture can be read on our Blog page for 11 October 2017. Wednesday 29 November 2017, 1.00 pm. Lucy Cavendish College. What happens when music happens? From her earliest diary entries to her last hastily scribbled notes, Woolf’s writings reflect an incredibly sensitive ear to music. She resists scholarly analyses of musical performance, but is clearly fascinated by the intensely performative effects that music has on individual listeners and assembled audiences. The type of performance – formal or improvised, professional or amateur – is also important, as is the space where listening takes place – whether a concert room, a private salon, a street, or even a turnip field. In this talk, Claire Davison explore the models of musical performance that Woolf evokes and the transformative, political undercurrents of music in the making. As we shall see, there are romantic, Keatsian echoes to be seized (‘Heard melodies are sweet, but those unheard / Are sweeter…’) (1) as well as stridently Tolstoyan notes (‘Where you want to have slaves, there you should have as much music as possible’). (2) But above all, for Woolf, musical performance and interpretation are empowering forms of expression, as much (if not more) the preserve of the common listener as the inspired performer. (1) John Keats, ‘Ode to a Grecian Urn’, Stanza 2. (2) Maxim Gorky, ‘Reminiscences of Leo Tolstoy’, translated by Leonard Woolf and S. S. Koteliansky, Hogarth Press, 1920. An extract from the lecture can be read on our Blog page for 30 November 2017. Claire Davison is Professor of Modernist Studies at the Université Sorbonne Nouvelle, Paris, and Chair of the French Virginia Woolf Society. She is the author of Translation as Collaboration: Virginia Woolf, Katherine Mansfield and S. S. Koteliansky (2014) and has co-edited several volumes of Katherine Mansfield's work for Edinburgh University Press. Her essay 'Hearing the World "in Full Orchestra": Voyaging Out with Woolf, Darwin, and Music' is published in Woolf Studies Annual (2017). Website: here. 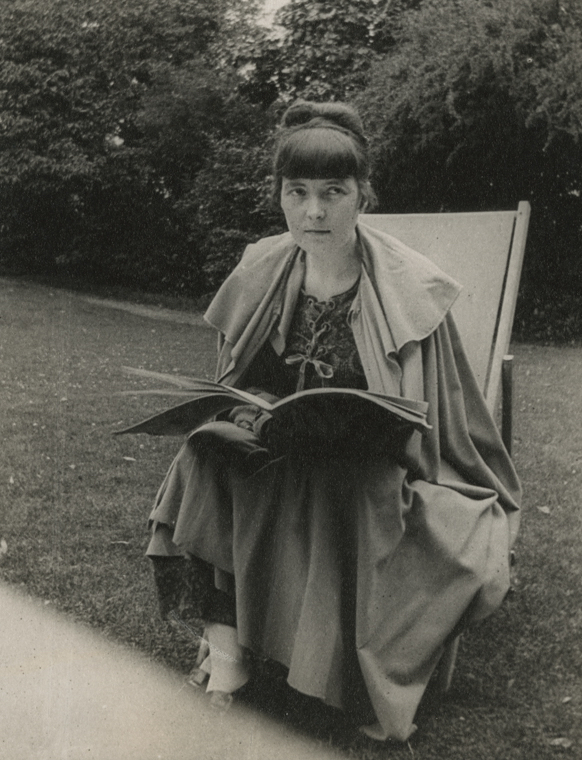 Claire will lecture on Katherine Mansfield in our 2018 Summer Course, Women Writers: Emily Bronte to Elizabeth Bowen. Other previous Virginia Woolf talks include Gillian Beer on Reading The Waves across a Lifetime (January 2017), Nanette O'Brien on food in A Room of One's Own (March 2017), and Susan Sellers on Virginia Woolf and the Essay (April 2017). Further information about these talks can be found on our blog pages for February, March and May 2017.